Pictured: Another change made is the “Let’s Ask America” logo (right). The return of the game show that contestants can play from their home or office “Let’s Ask America’ is asking more questions from more select groups, and coming back in a big way with a sleek new game show set and a fully converted host Kevin Pereira into a legit game show host which requires him to wear full-on suits for each episode. 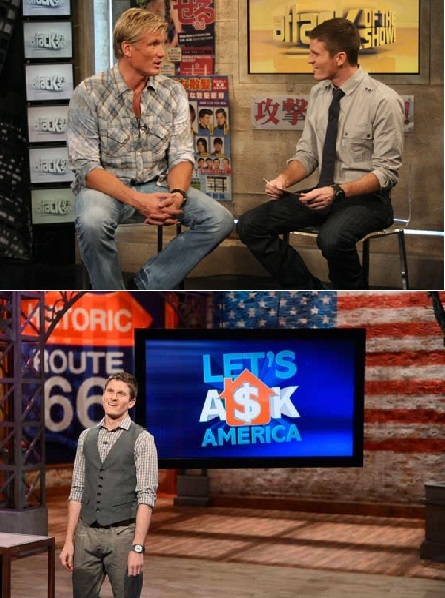 Pictured (top) host Kevin Pereira on “Attack of the Show” set, (bottom) “Let’s Ask America” season one set. The host was very talkative about Mily Cyrus’ eyebrow raising antics on the stage of the MTV Video Music Awards. Pereira was fascinated by all the twerking going-on during the awards. The audience encouraged him to twerk. As he was about to do it to have some fun, one of the producers of the show stepped-in to put a stop to it. Sorry fans, there will be no twerking done in front of the “Let’s Ask America” camera by Pereira. Most of the questions throughout much of the game are asked about a particular group of people. For example: maids, teachers, waiters, parents, etc. Some sample questions are: What celebrity did maids say were the worst guests? The possible answers were: Lindsay Lohan, Charile Sheen, or Amanda Bynes. Another question was Which type of student did teachers say are their lease favorite: class clown, the know it all, or the jock. For another questions, waiters were asked what they commonly tell their customers: That’s my favorite dish, the soup is homemade. Host Pereira announces what percent of those surveyed answered which questions. It was unclear of how many people the producers of the show surveyed in each group. 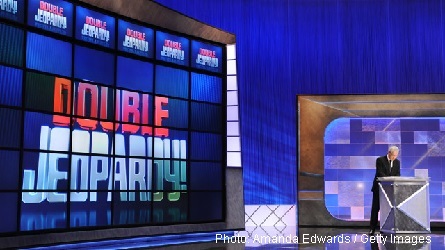 When contestant’s tie at the end of a round and end-up with the same amount of money the tie-breaker is that they each have to answer a question by the host that is a multiple choice two-answer question. For example, one tie-breaker question that was asked was what is the more popular condiment that American’s prefer for their hotdogs- mustard or ketchup. The two contestants had to answer by running-off and fetching the one that they thought was the correct answer. Another tie-breaker question was what do wives say their husbands hurt themselves with more? – knife or hammer. The third round tie-breaker is still called “Dash for Cash,” and it requires contestants to grab a requested item and sometimes doing something with the items. One “Dash for Cash” asked the two players to grab enough toilet paper to come back and make a neck tie out of it. Another one asked the players to grab a cooking pot big enough to place over their heads. 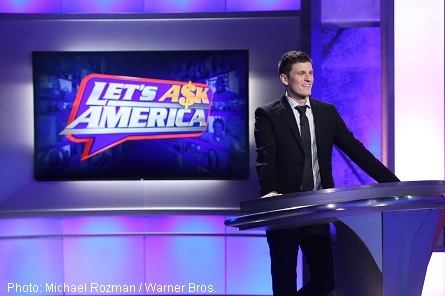 New “Let’s Ask America” set is much like that of Jeopardy’s (above). An audience member asked Pereira before the start of the show that when a contestant is eliminated if they get to keep the money that they earned in the game. Pereira said “no,” and that the show does mail them a consultation gift. Typically a gift bag. He said that the show also sends them “Let’s Ask America” T-shirts. When the Warn-Up Host heard Pereira mention the T-Shirts, he asked if he could have one to give out to an audience member as a prize. We’re not sure what happened, but after he was told that someone would find out for him, a T-Shirt was never produced. 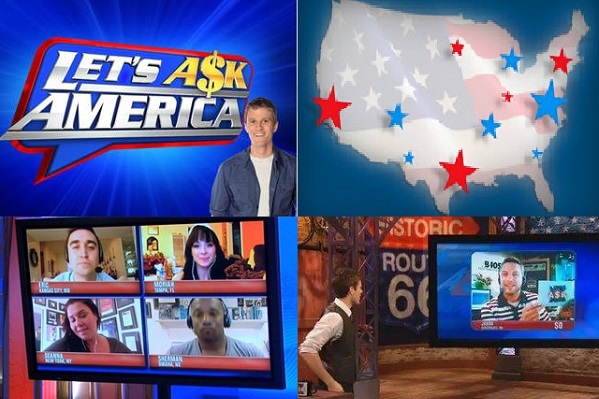 “Let’s Ask America” returns with it’s Skype game show contestants on Monday, September 9th. Visit letsaskamerica.tv for local listings.